All of the patches were made by inserting segments one at a time directly into the web. Sometimes the thread was starched, which made it stiffer and easier to work with. 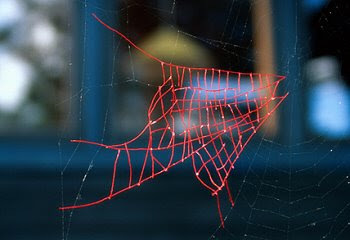 The short threads were held in place by the stickiness of the spider web itself; longer threads were reinforced by dipping the tips into white glue. I think the spiders are looking at the repaired webs saying, "Dude, it's ok. Really. I've moved on."